Our 18-hole golf league is always looking for ways to have a little fun with our serious golf. This year I organized an event around an Alice in Wonderland/Queen of Hearts theme. The first game below is played on the golf course. It is a simple little team game that doesn’t get in the way of real golf. The second game, “Off With Her Head” takes five to ten minutes and is played at the table before lunch. Have fun! How to Play: This is a team game. Look in your goodie bag for a playing card. This is your suit. Play a regular round of golf. When you reach the green, look in the hole to find a spade, club, heart, or diamond. If it is your suit, record your score (minus your handicap dots) as the team score for that hole. 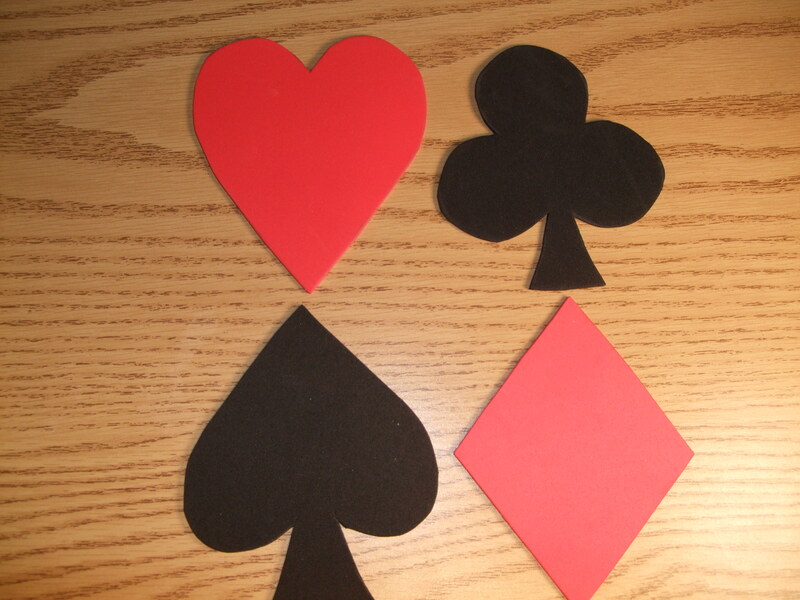 If you find a Queen of Hearts card in the hole, your team may choose any player’s score for that hole. If you have less than a four-some, alternate scores when the missing suit is found in the hole. The team with the lowest net score will win a special place in our hearts and points for the event. Hole 9 – The White Rabbit left a trail. (a chalk line down the fairway) The player with the ball closest to the trail wins a prize. Hole 12 – Alice entered Wonderland by going down a rabbit hole. If your ball is closest to the hole, you win! Winner of the Queen of Hearts’ Tournament will be the player with the lowest individual net score. OFF WITH HER HEAD ! Are your luncheons boring? Play a table game. We had fun with this Queen of Hearts themed, five-minute game. This game works best with at least 15 people. Tables of six or eight each work well, but any sized group can be divided into equal sizes to stand together. Choose riddles from below, one less than the number in the groups: if you have six at a table, choose five riddles. Ask everyone to stand at their tables and read the introduction to them, explaining that the riddle will apply to someone in their group. When that person is decided upon, point to her and shout, “Off With Her Head!” That person will sit down. The last woman standing in each group will win the door prize, the center piece, or whatever. The Queen, Jabberwacky, the White Rabbit all spoke in confusing riddles. Here are a few riddles you may not have read in the story. Everyone stand please. Each of the Queen’s riddles describes someone at your table. After each rhyme, select that woman, point to her and shout: “Off with her head!” She will then sit down. 1) The Queen of Hearts loves colors bright. Those without, must hide from sight. Who ‘round your table has the least red? though the Queen of Hearts ordered a frown. Who among you has the best smile instead? 3) The Mad Hatter dearly loved his chapeau. That angered the Queen, made him her foe. but up-staging the Queen is only for fools. If you wear the most bling, you should have sped. 5) Alice swallowed a pill to make herself small. The Queen of Hearts didn’t like that at all. The smallest of you, has much to dread. 6) Alice took another pill, but that wasn’t wise. She cut the Queen down to size. The tallest of you know what her majesty said. 7) The Queen of Hearts hates to be bested. It’s the height of fashion to be flat-chested. Which at the table needs most to be fed? 8) The Queen of Hearts was a jealous bride. She keeps the King close to her side. Which of you was most recently wed? We hit the ball and have a nice day. If your net score is lowest, go back to bed. smiled and had fun with it. Enjoy! Next ›How Well Do you REALLY Know Everyday Words?